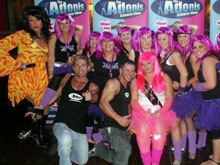 Due to unprecedented demand we have added a further date to Adonis Cabaret at Halo & Quilted Llama, Leeds. The show is now running on 3rd September so if you haven’t checked it out yet or couldn’t get to the previous shows this could be the one for you. We have had great feedback and some nice comments from the Leeds party-goers.. Your kind comments are always appreciated by the performers – keep them coming!